Kim Kardashian and her family were spotted enjoying some time on board a yacht while vacationing in Greece this weekend. The mom-to-be, who is due with her first child in July, showed off her growing belly in a cute red sundress. 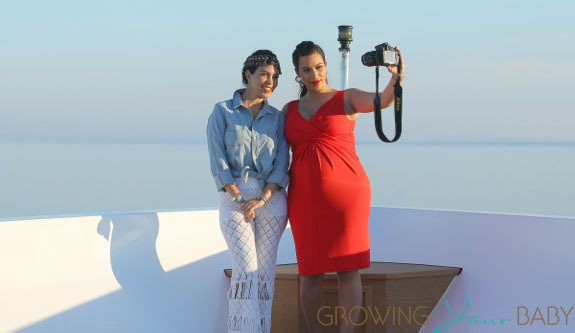 Photographers caught her and Kourtney in a mini photoshoot taking pictures of the scenery and each other on the luxury liner. The family is said to be vacationing in Greece for 10 days and are capturing the whole adventure for their reality show Keeping Up With The Kardashians. Kris, Kourtney, Mason and Penelope started the trip off in London last week and then joined Kim, Khloe, Kendall and Kylie, brothers Brody and Brandon and step-dad Bruce in Greece. Not long after their cruise around the Agean sea, the family boarded a private plane and headed to another beautiful location.